I made butternut squash soup in the vita mix for lunch today. Tasty! Processing the soup for about 8 minutes heats it and leaves quite a delicate texture. The texture actually seems to evaporate as it hits your tongue leaving a wonderful rich flavor and aroma behind. It is like eating essence. Even though it is butternut squash, this elevates simple into the sublime! Pre-heat the oven to 350°F. Lightly pierce the squash with a knife in a couple of places. Place the whole squash on a parchment lined baking sheet and roast the squash for 1-2 hours or until done. You can tell when it is done by piercing the squash with a knife. If it goes in without resistance, the squash is done. Remove from the oven and cool. Peel and remove the seeds from the center of the squash. 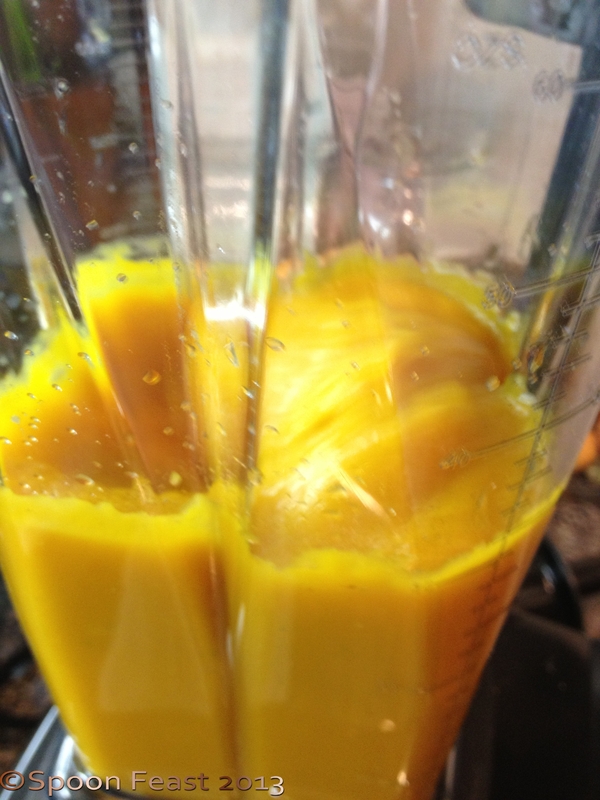 Place the squash, and remaining ingredients except the cream, into the blender and process. Begin on low variable and move up to number 10. The mixture should form 4 mounds inside the work bowl. If you want, thin with chicken stock or water at this point. Process for 7-8 minutes or until the mixture releases steam. Add the cream and process for another minute. 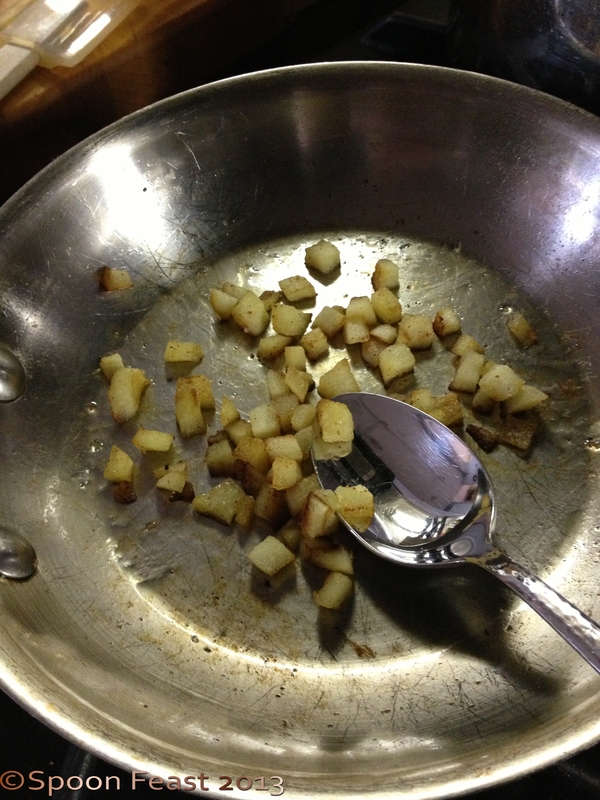 In the meantime, dice some of the apple and saute in a very small amount of butter. Using a light hand, sprinkle them with cinnamon and nutmeg and a pinch of salt. Set aside to garnish the soup. 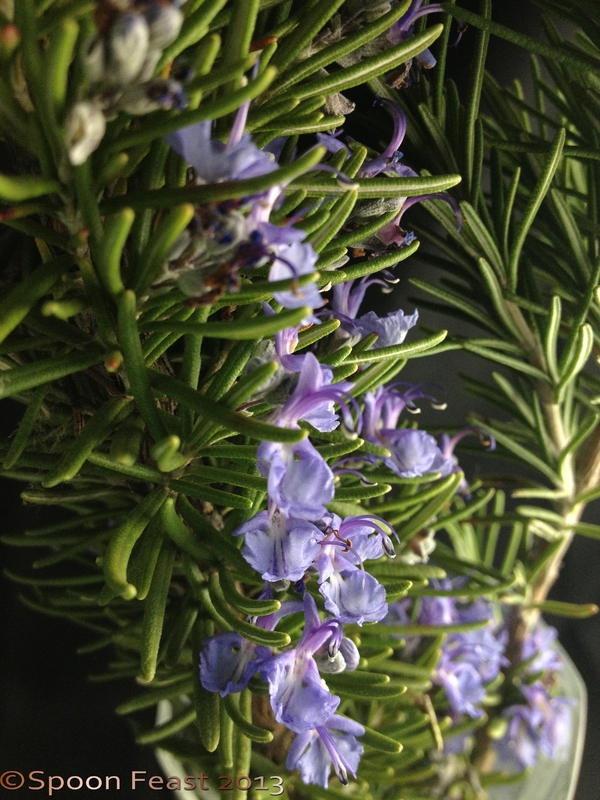 Harvest some rosemary flowers, also for garnish and a great flavor burst. To serve, ladle the soup into serving bowls, garnish each with sautéed diced apples and a few rosemary flowers. 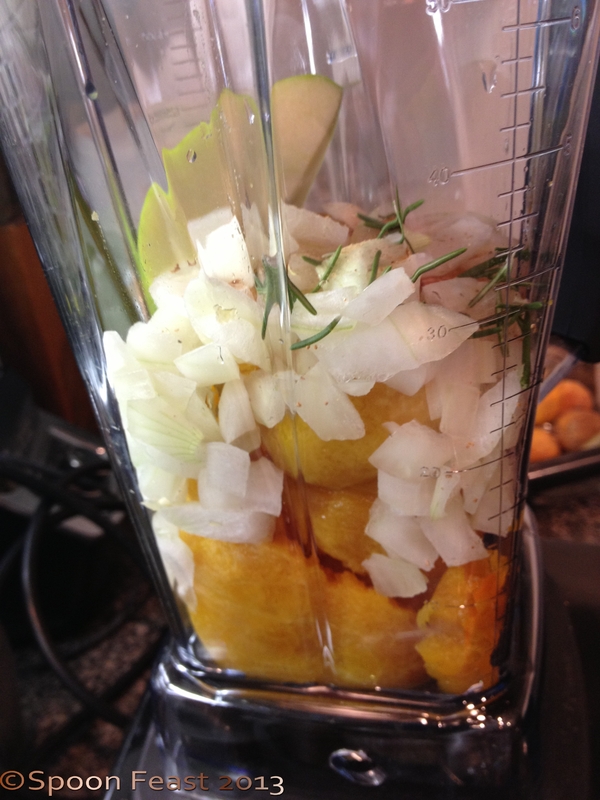 This entry was posted in Cooking, Recipes and tagged Black pepper, Butternut squash, cook, Granny Smith, Rosemary, Soup. Bookmark the permalink. Beautiful. I really want a vitamix. Thanks Mimi, while I don’t use it for everything, it would be a handy thing to have on hand. With the dry bowl, you can make flours and all kinds of other stuff! For me, the expense isn’t worth it unless you have an extra 500 dollars for kitchen stuff; which is why I am so grateful for this visiting one. Thanks CCU! Sometimes I see others photos and want to reach right in and take a bite! really deliciuos and comfort dish…..
springkled some crispy bacon would make it lovely evenmore…. 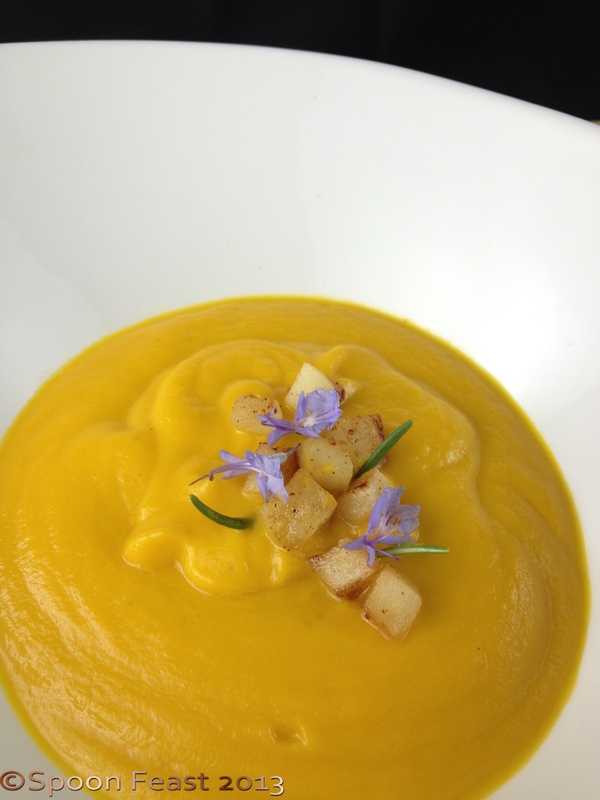 I love Butternut squash soup and this is so pretty with the rosemary flowers on top. I planted my rosemary for a long long time but never got any flowers on it. But…I’m so not good with my gardening skill. I’m already happy it didn’t die on me! hahaha…. Please try growing it again. It likes to be neglected and also likes “rough” living conditions. Forget to water it, rocky soil, lots of sun, plant it and forget it then you may be successful growing it. Get it out of a pot and into the ground so it can naturalize. I have never had any luck growing it in a pot. Thanks for your lovely comment!